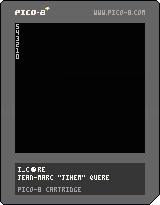 This is the core engine of a language (‘I’) and its virtual machine (all of this in PICO-8). You can create synonyms for a simplier use (see _ADD and _+). The operators + – * / and flr function are available. The ‘#’ duplicates the last value (of the stack). If the last value in the stack isn’t zero it calls NAME else it goes to the next instruction. This sounds crazy… So, why? I’m working on two games. In the first you have to build a program by stacking graphic items to draw on screen to replicate a drawing with the minimal amonth of items. In the second, some robots fight together using genetic algorithms to evolve (by sharing part of their own code to create new ones).